The main purpose of the stairs - it's different levels of space communications, as well as the possibility of lifting and lowering to the desired floor. In ancient times the staircase had a special purpose, it was thought that it connects the worlds, allowing to move up or down. Since the appearance of the first ladder accessories, mostly made of stone or branches of trees , it has been a few hundred years, which allowed to improve these designs, creating their various forms and types. Today, manufacture and installation of stairs acquired wide popularity, they are widely used not only in urban buildings, but in the architectural buildings in the country. It is difficult to imagine any multi-story building without a ladder structure, even despite the modern ways of ascent or descent, such as an elevator. The stairs consists of individual elements, in principle, it is a fairly simple one: base, steps and fencing, with handrails and railings. 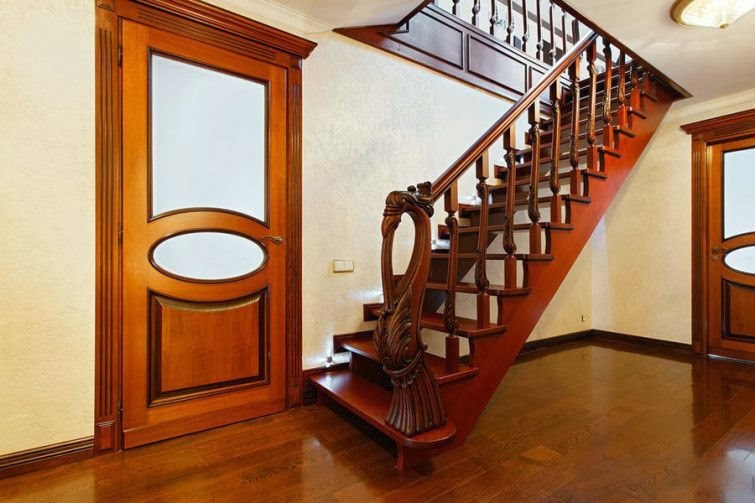 Bottom of the stairs is considered to support the entire load-bearing structure, is its leading element, which largely depends on the type of stairs. Thus, there are several kinds of bases: bowstring, Boltzmann and leg. Kosour - is supporting beam, which is located under the stair steps in the construction of stairs may be provided one or two. Bowstring - also represents a carrier beam which is arranged at the ends of stairs like tightly fixing step may also be one or two of the bowstring. Boltzmann - is, in fact, carrying stair railings, steps by which one end attached by struts to the rail, and the other - join the wall. central support - support the spiral staircase, anyway - the central pillar on which the main load is distributed around which secured spiral steps. Each base requires its own particular location in the interior stairs room. Thus, the construction with stringers or beams based on, which are supported through staircases or may be self-supporting, having a support point at the top and only the lower part of the span. These are generally used to give a more three-dimensional shape and occupy a large area in size. Quite another matter - a ladder on rails, its design looks almost weightless, elegant and compact due to the fact that the stage or attached directly to the wall or placed on the core support. As for the support leg, it is used only one type of stairs rising upward in a spiral. The second important element of the ladder steps are considered. They depending on the size and appearance, provide convenience step and attach the stairs or pomposity or same grace. Types of stairs is a different set into the base, as a rule, put some form of geometric shapes: rectangle, Star, Triangle. Rung of the ladder may have a closed form, in this case using additional elements - closed or open, when they are not provided. steps width is also different, mainly their minimum value - it is 200-250 mm, and the maximum - not more than 400 mm, but such parameters are conditional, and you can pick up a non-standard sizes. Railing with handrail - this is the final element of the ladder structure, it is performs the function of protection against accidental drops. This is especially true for steep spiral staircases that, despite all the splendor of appearance, are considered among the most dangerous in terms of injury.Exterior fencing may also have a different shape, it is made ​​in the form of pillars, beams or rectangular elements. Handrails and stair railings are part of the fence, and on the one hand, provide security, and on the other - can make all the ladder design originality, perfection and beauty. Set of building materials used today allows a various options for making stairs. Typically, the supporting structure is made of reinforced concrete, wood or metal, and decorate other facing materials: stone, forging, glass, ceramic tiles, mosaics, and the like. Is recognized and the best combination of multiple materials in a ladder structure, for example, wood, metal, or metal, glass, and natural stone. 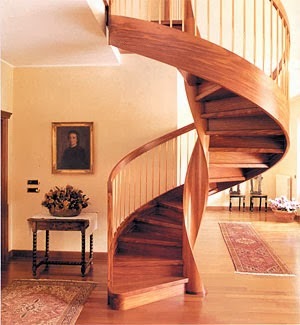 The most commonly used for the manufacture of wood stairs. types of wood: oak, pine, larch, ash, maple. However, there are some features to use it - for starters, wood is well dried, allowed a minimum percentage of moisture from 6% to 12%, then wooden stairs glued elements of several boards that allows them to keep for years to come and save you from the appearance of the defect- fluctuations in temperature.It is also very important to remember that the manufacture of parts of their geometry must have a perfect shape, only in this case it is possible to avoid further strain. Before the installation of wooden stairs surface with lacquer or oil. Varnish provides a high level of wear resistance steps, but eventually cleared, which requires additional grinding worn surfaces. Oil also penetrates deep into the wood, brightly showing its texture and provides longer operating elements of the stairs. Ready to assemble and install wooden stairs can be only after all finishing works, otherwise it may hurt its appearance. 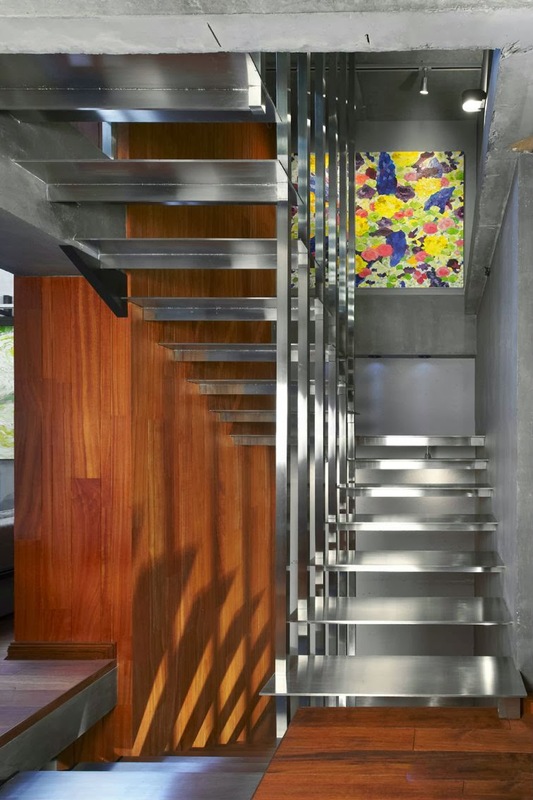 Another popular stair material, especially for the style of hi-tech, metal considered. Typically, the base ladder and its speed is used for stainless steel or cast iron. Same frame made ​​of stainless steel material, most commonly used for spiral staircases because of the high load on its base. 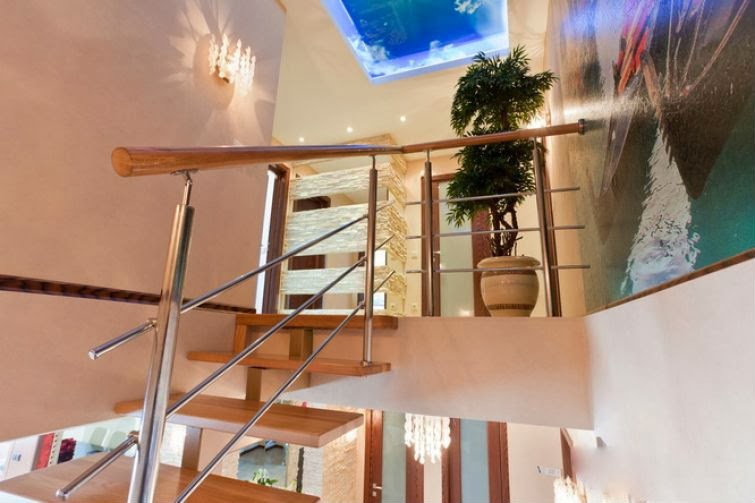 Besides, also made ​​of metal stair railings. For the manufacture of handrails metal can be subjected to a special galvanic treatment such as chrome plating, nickel and more. But it is also worth to remember that in this case you should use threaded connections, which are fastened with a nut. Also, the metal can give different effects: scrapes, bronze or opacity, using special coating. 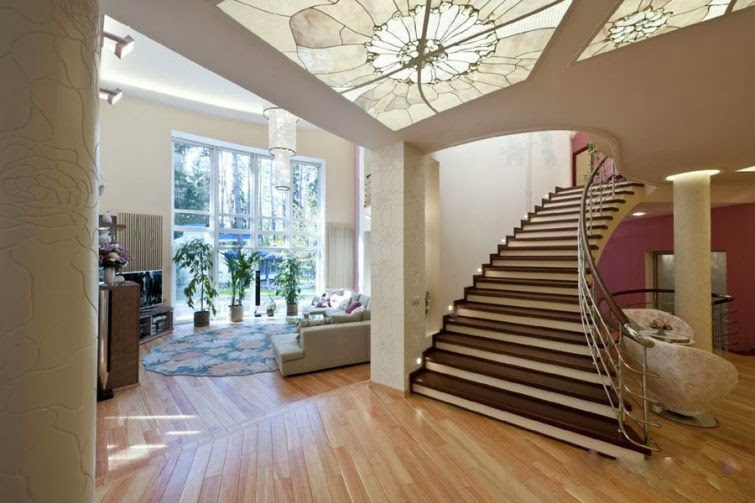 Look great in the interior and forged or bent metal elements stairs giving the interior a special atmosphere of wealth. Stone stairs also have a unique appearance and more durable. Most often to perform their stone staircases used marble or granite. As the base usually take concrete. If the ladder is installed in the house, then in principle, does not matter which of the building materials to choose, as they both have a low degree of wear. But if it's stairs to the street, stone steps, especially in winter, can pose a serious danger, especially if they were subjected to polishing. Safer option - it's stone surface, the top layer of which was heat treated differently - roasting fire, resulting from this will help to avoid roughness light falling from a ladder.